For the second year in a row, The Leader’s Institute® came to Yorba Linda Unified School District in Los Angeles, CA on to deliver a fun and meaningful team building event that gives back to the community. After doing a Build-A-Bike® team event last year with Chris McNeany, they asked him to come back and do an Ace Race Mini Golf team building activity this year. 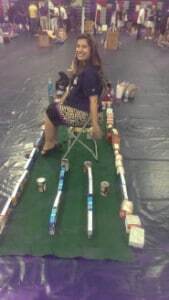 In an Ace Race, each team constructs a mini-golf hole made out of non-perishable food items, so in the first part of the activity, the groups get to work together to build the entire golf course from scratch. Then, once the course is completed, teams must race through the course trying to get a hole-in-one at each hole in the newly-constructed course. Enthusiastic laughs and cheers erupted throughout the room as teams race from hole to hole trying to be the first to finish. The top three teams participated in a sudden-death putt-off to be crowned champions. The food items were donated to a local food bank at the end of the event. This group of 180 participants were a combination of administrators and teachers. The group had a great time and were able to donate approximately 1,680 pounds of food to families in need! Thanks for having us come back and have a great time with such an enthusiastic group! Chris McNeany is a Vice President and Instructor for the The Leader’s Institute®. He is based in Los Angeles, California, but he teaches classes in San Diego, San Francisco, Las Vegas, and Seattle as well.